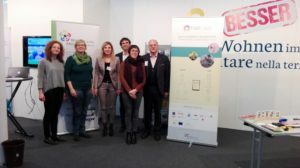 During the press conference, the co-operative Wohnen im Alter (WIA) and the project FairCare were introduced to the public. After the press conference, a stall of ‘Wohnen im Alter’ was presented on the trade fair. There, a FairCare roll-up was presented for two days and WIA staff was available for questions and information needs. The target groups reached by the presence at the fair were older adults, journalists, and visitors of the autumn trade fair who were mainly local citizens.